Last Friday and Saturday were beautiful days; the weather jumped from winter to summer! Mark and I took the opportunity to do some work in our garden. 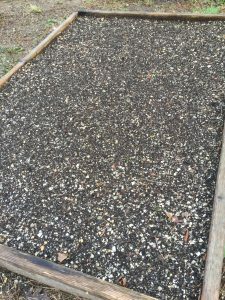 We raked out the leaves, pulled the remaining weeds and thorns from last fall, and smoothed out the soil in many of the raised beds in preparation of planting seeds. Mark planted several of the cooler weather crops; snap peas, kale, and arugula, and today I’m thankful for the rain that is watering the seeds, hopefully not washing them away! 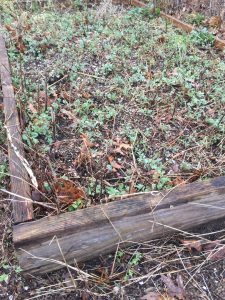 Neglect of our garden through the fall and winter months allowed for many unwanted leaves, weeds, and thorns to take over. I suppose I could just dig holes amidst these leaves and weeds and hope that the seeds would grow and produce a crop. But, somehow I just know that won’t work. Gardens aren’t the only things that get messy when neglected. When “winters” come into our lives they cause neglect and our hearts become messy! “Winters” of the heart come in many different forms, with many different intensities, and can last different lengths of time. But the affects of “winters” can leave the heart filled with leaves, weeds, and thorns. Thankfully we have a Good Gardener who’s unconditional love for us will carefully tend and restore our hearts. A “winter” of the heart can be busyness. One morning we find we are too busy to read our Bible, pray, and, worship. One day becomes one week, one week becomes one month, and eventually the weeds of busyness have taken over and we can’t remember the last time we spent time alone with God. A “winter” of the heart can be disappointment. Disappointment from an unanswered prayer or from an unfulfilled promise from God can bring “winter” to the heart. Disappointment can plant a weed, a lie, that God doesn’t care, that He can’t be trusted. The weed of disappointment will send out roots of doubt and unbelief. A “winter” of the heart can be unforgiveness. A wounded heart brings “winter” by building walls of protection from further hurt. While they may protect from hurt, they isolate from love. Walls around the unforgiving heart are as thorns that keep others away from us, including God. A “winter” of the heart can be self-sufficiency. “Winters” of the heart can happen even when everything is going well. It can be during those times we begin to rely on ourselves, believing we can handle things on our own, and taking credit for our accomplishments; we become proud. Pride is as the fall leaves that cover the heart to hide the weeds and thorns of neglect so that we appear good to others. 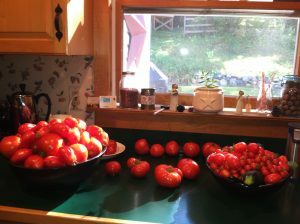 So what is it that motivates me to roll up my sleeves and tackle the mess of my neglected garden? It’s the potential a cleaned out garden bed represents; free from all the mess that collected during the season of neglect. The hope of new life held within seeds as they pop through the soil. And the anticipation of the growing plants developing a delicious harvest! I can’t help but think; because we are created in God’s image, He feels the same way. He has a hope and a future for us! And He is filled with great anticipation to see the fruit we will bear! “Winters” are the harm the enemy meant, that can be turned to the good God intended! So, if the Gardener is God, and the leaves, weeds, and thorns are the sins and bad habits that grow in our hearts, our hearts would be the soil. And so, as the soil didn’t do anything to keep me from tending it, so our hearts need to be yielded and open to the presence of God as He takes His strong hand and lovingly rakes, digs, and smoothes our hearts. When we invite the Good Gardener to tend our neglected hearts the Holy Spirit will begin to rake away our pride so we can better see the weeds and thorns that are making our hearts so messy. When we humble ourselves and acknowledge that we can’t tend our own hearts and allow God to come into the mess, He will rake away our pride. Pride always needs to be removed so the weeds and thorns will be visible. Once pride is removed, the weeds of busyness can be pulled and replaced with seeds of desire to spend time with God. The weeds of disappointment that spread doubts and unbelief can be taken away and replaced with seeds of faith and trust. Those thorns of unforgiveness that have kept us isolated will be striped away as we have the courage to choose to forgive. A heart that is tended by the Good Gardener will remain surrendered to the raking, digging, and smoothing that is required to produce much fruit! Previous Previous post: Planting Seeds!